Over 80 per cent of the 12.2 million tonnes of plastic entering the marine environment every year comes from land-based sources, the research has found, the biggest contributor for which is larger plastic litter, including items like drinks bottles and other types of plastic packaging. There have been high profile projects to develop technology that intercepts marine litter, notably the Ocean Cleanup barrier, which will this year be tested 23 kilometres off the coast of the Netherlands in the North Sea, with plans to deploy a 62-mile-long barrier in the Pacific Ocean in 2020. 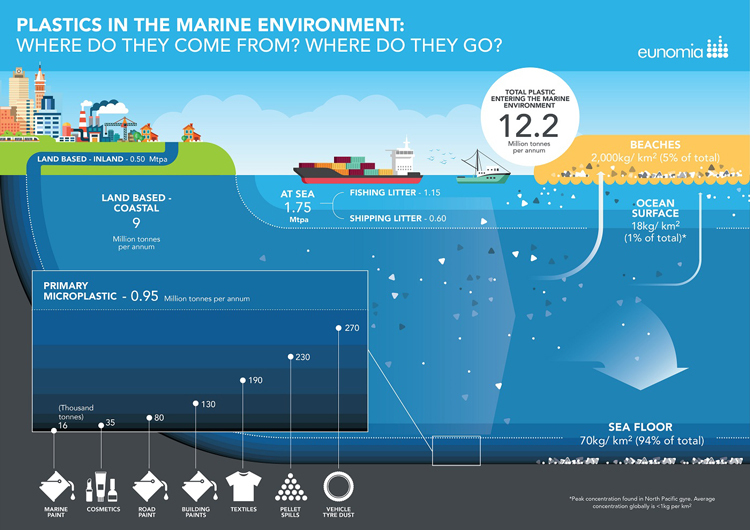 However, Eunomia says that barely one per cent of marine plastics are to be found floating at or near the ocean’s surface, with an average of less than one kilogramme (kg) found in each square kilometre (km2) of ocean. Though this concentration increases at certain mid-ocean locations, with the highest concentration recorded in the North Pacific Gyre at 18kg/km2, 94 per cent of plastic that enters the ocean ends up on the sea floor. 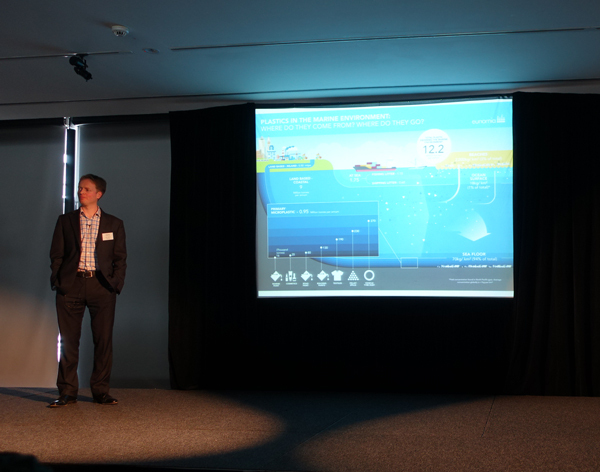 There is, Eunomia says, now on average an estimated 70kg of plastic in each square kilometre of seabed. More effective clean-up measures, it suggests, could be carried out on beaches, where the amount of plastic is estimated to be around five times greater than the ocean’s surface, and at a much higher concentration – 2,000kg/km2. Litter found on beaches is a mix of items that have been dropped directly and those that have washed up. Eunomia suggests that this ‘flux’ of litter shows that by removing beach litter, a valuable impact can be made on the plastic pollution of the sea. 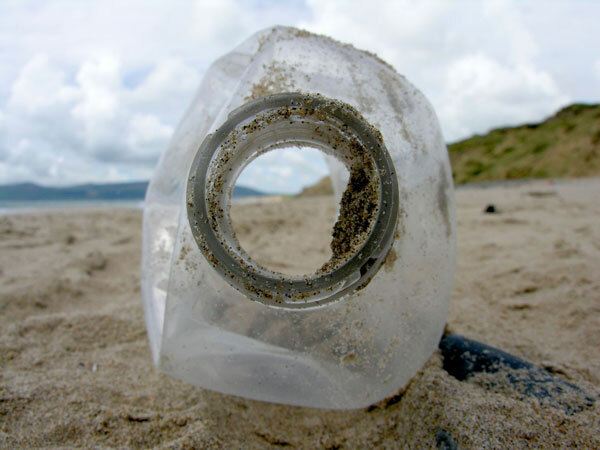 Although the research highlights larger plastic litter as the major source of plastic pollution, Eunomia says that the importance of primary microplastic pollution is ‘increasingly understood’, with an Environmental Audit Committee inquiry currently seeking to assess the environmental impact of the tiny plastic fragments that make their way into waterways. The consultancy’s research estimates that 0.95 million of the 12.2 million tonnes of plastic that enters the marine environment globally every year is made up of primary microplastics. Vehicle tyre dust is the biggest contributor for this form of plastic pollution, contributing 270,000 tonnes a year. Pellet spills and textiles are other major culprits, providing 230,000 and 190,000 tonnes respectively. Microbeads used as exfoliants in cosmetics, which have been banned in the United States, effective 2018, caused 35,000 tonnes of marine plastic pollution a year. Summarising the conclusions taken from the research, Sherrington suggested that work to reduce litter, such as a charge on disposable packaging, could have a big impact on marine pollution. He said: “Prevention is usually better than cure, and there’s a lot more we could do to stop plastic from entering the marine environment in the first place. Preventing waste and preventing litter can go hand in hand. More information about the problem of marine litter can be found in Resource’s feature article. The Scottish Government has launched a marine litter strategy to reduce the amount of waste littered at sea and on coastlines. The Ocean Cleanup organisation plans to deploy a 100 metre-long floating barrier device to test passive technology designed for clearing the oceans of plastic pollution.